Prosecuting Authority 'Unwilling' to Indict President's Son? Cape Town — The National Prosecuting Authority (NPA) is expected to provisionally withdraw corruption charges against Duduzane Zuma, Business Day reports. Zuma's lawyers, who refused to comment, allegedly received a letter from the NPA informing them of the decision to provisionally withdraw charges against Zuma. The state declined to comment and would only do so after court proceedings on Thursday, NPA spokesperson Phindi Mjonondwane Aldo said. This move by the NPA follows its choice to provisionally withdraw charges against the Gupta family and their business associates over the Estina Dairy Farm Project scam. 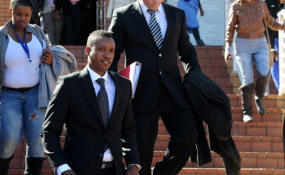 Duduzane Zuma faces charges of corruption and conspiracy to commit corruption relating to his knowledge of an alleged bribe offer of R600 million made to former deputy finance minister Mcebisi Jonas in 2015 by a member of the Gupta family.